I got so many emails and comments about the robin redbreast post, I thought I'd share another unique Christmas tradition with you. Let me explain how I know about these traditions. I taught Girls in Action (GA's) for fourteen years. GA's teaches elementary aged girls about missions and cultures from around the world. I think it's so important for kids to learn about different cultures because it isn't taught in schools much anymore. Every December, GA's not only learn about Lottie Moon and the Christmas offering for International Missions, they also learn about Christmas traditions from another country. One year we studied about the Ukraine. Ukrainians do not clean spider webs from their homes during the weeks leading up to Christmas. The legend states that a spider wove an intricate web to entertain the baby Jesus while in the stable. The web was his first toy and considered special. Do you have any strange Christmas traditions in your family? I've seen the spider web trees before at a Christmas around the world exhibit. Neat story behind it. Thanks! Oh wow, it's fun to learn about the traditions of other countries. My aunt was from the Ukraine, if she was still with us, I would have loved to ask her all about this! We use stars as Xmas decors because of our attachment to that Christmas story, the three Kings were guided by the star to Bethlehem. It is so fun reading all the different tales from around the world. Hi Ricki...wonderful post. So much to learn. Thanks for sharing. I didn't know of this tradition. What a beautiful ornament and story. 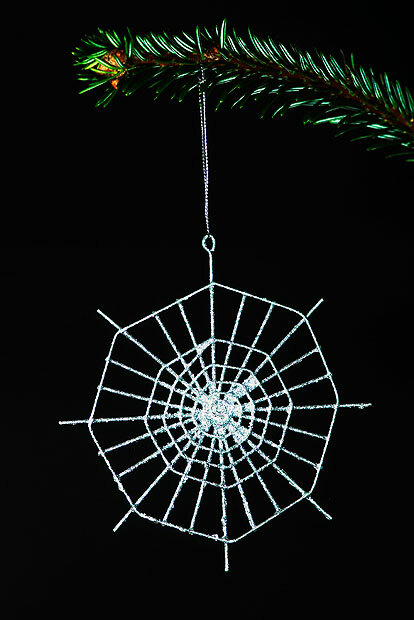 I am definitely going to hide spiderweb ornaments on my tree in the future!